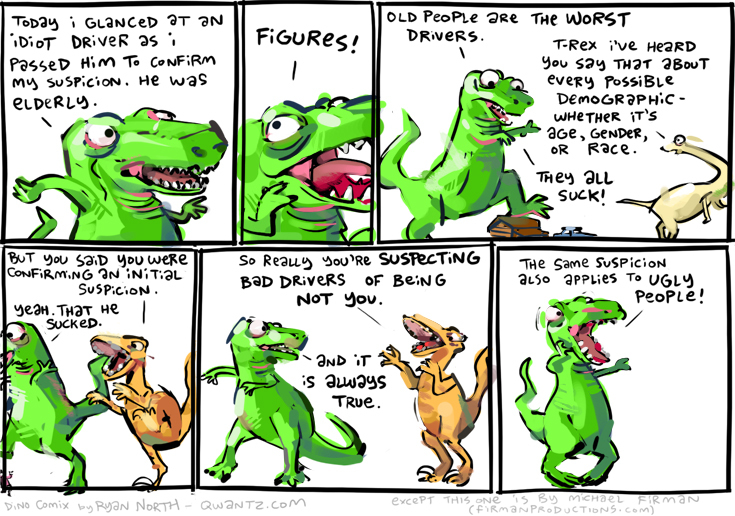 Dinosaur Comics - June 11th, 2009 - awesome fun times! guest week 2009: michael firman of moe! June 11th, 2009: This week is a GUEST WEEK! It's where I went up to some cartoonists I admire and said "Hey would you like to do a Dinosaur Comic? You can do whatever you want, HONEST" and they said "YES, [WE] WILL!" and here we are! I am excited for these. Here's how it's going to go down! One year ago today: once the horse puns were out of the way, there was really nothing left for the characters to do. JUST LIKE IN REAL LIFE? ?